DALLAS, TX--(Marketwire - December 1, 2008) - Dallas artist Laura Elia's works will be exhibited at the first solo artist exhibition at the new RISING gallery www.risinggallery.com, located at 4631 Insurance Road, in Dallas' popular Knox Street area. Elia's works were selected on the basis of their originality, uplifting messages and dynamic appeal. The public is invited to meet the artist at an opening cocktail reception at the gallery on Thursday, Dec. 4, from 6:00 to 9:00 pm. Oil and acrylic paintings from Elia's "Lotus" and "Awake" series of inspirational paintings will be exhibited and for sale at RISING through December 31. Each of the colorful, abstract paintings was inspired by Elia's exploration of Tibetan Buddhism and has pieces of Tibetan prayer flags embedded within -- along with a humble request for compassion, courage, knowledge, or end to suffering. Elia's solo show includes 25 pieces. 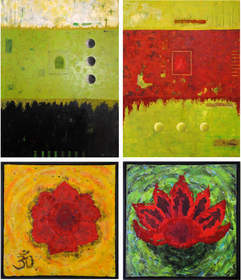 There will be a series of (8) 24" x 24" paintings of the lotus flower, the traditional symbol of transformation ($795 each). "The Lotus Series is based on a theme of transformation and is inspired by the lotus flower's pattern of growth, which is born from mud, rises through murky waters, and presents its pristine beauty in the clear light of day. Each of us inherently possesses the power to rise from our own self-created muck and bloom into radiant, enlightened beings," Elia explains. Visitors will also find (5) 12" x 12" and (5) 8" x 8" pieces all under $300. "I'm happy to be able to exhibit some very affordable pieces at the RISING gallery," says Elia. "I created these spiritually-based paintings to give people hope and inspiration during the busy holiday season." A rising star in the art world, Elia's work is also displayed at Exhale Dallas (5300 East Mockingbird Lane) and was recently featured in Craighead Green's juried New Texas Talent exhibition, which promotes emerging artists. Elia contributes 10% of proceeds from her paintings to The International Campaign for Tibet (ICT). Founded in 1988, ICT is a non-profit membership organization which works to promote human rights, religious tolerance, and democratic freedoms for the people of Tibet (www.savetibet.org). For more information or to view a gallery of Elia's paintings, visit www.awakeart.net or call 214-906-0230.